OBJECTIVE To estimate the causal association between intake of dairy products and incident type 2 diabetes. 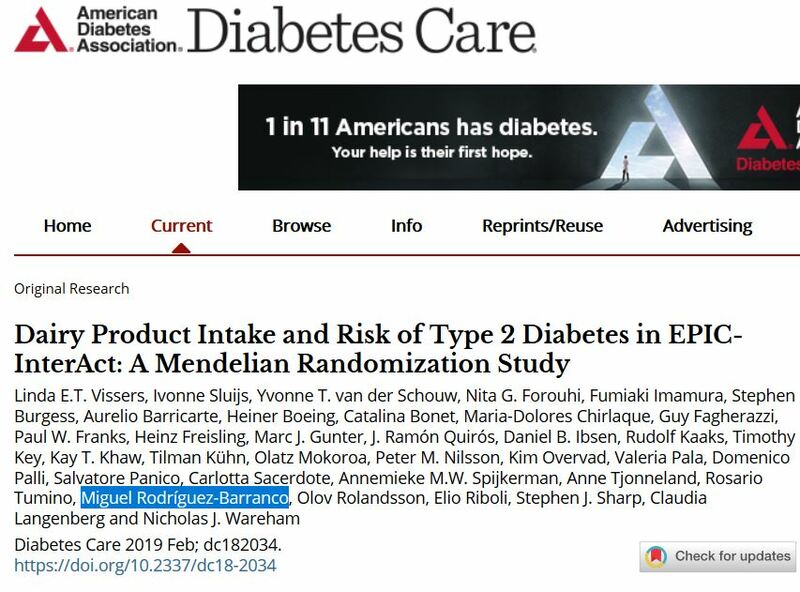 RESEARCH DESIGN AND METHODS The analysis included 21,820 European individuals (9,686 diabetes cases) of the EPIC-InterAct case-cohort study. Participants were genotyped, and rs4988235 (LCT-12910C>T), a SNP for lactase persistence (LP) which enables digestion of dairy sugar, i.e., lactose, was imputed. Baseline dietary intakes were assessed with diet questionnaires. We investigated the associations between imputed SNP dosage for rs4988235 and intake of dairy products and other foods through linear regression. Mendelian randomization (MR) estimates for the milk-diabetes relationship were obtained through a two-stage least squares regression. RESULTS Each additional LP allele was associated with a higher intake of milk (β 17.1 g/day, 95% CI 10.6–23.6) and milk beverages (β 2.8 g/day, 95% CI 1.0–4.5) but not with intake of other dairy products. Other dietary intakes associated with rs4988235 included fruits (β −7.0 g/day, 95% CI −12.4 to −1.7 per additional LP allele), nonalcoholic beverages (β −18.0 g/day, 95% CI −34.4 to −1.6), and wine (β −4.8 g/day, 95% CI −9.1 to −0.6). In instrumental variable analysis, LP-associated milk intake was not associated with diabetes (hazard ratio 0.99per 15 g/day, 95% CI 0.93–1.05). CONCLUSIONS rs4988235 was associated with milk intake but not with intake of other dairy products. This MR study does not suggest that milk intake is associated with diabetes, which is consistent with previous observational and genetic associations. LP may be associated with intake of other foods as well, but owing to the modest associations we consider it unlikely that this has caused the observed null result.